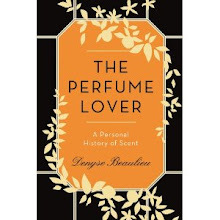 Only one month to go before The Perfume Lover comes out. And another five before the launch of Séville à l’aube… One story told with words; the other with scent. When I told Bertrand the story, he said it would make a very good perfume. And then he walked his talk by making it. He asked me what I wanted from it. 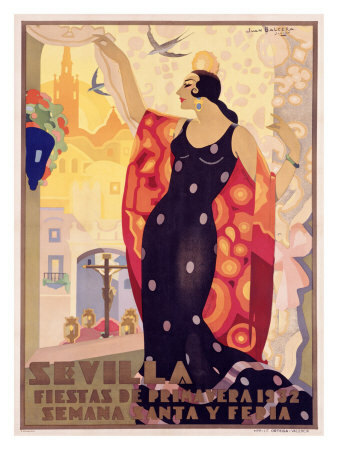 And so my night in Seville inspired a magnificent scent, which in turn inspired me to write my book. The development of Séville à l’aube forms the narrative arc of The Perfume Lover: it is around this thrilling journey that I weave the other threads. Encounters with the people who inspired me. History, because every truly creative fragrance springs from it and adds a few more lines to it. Essays, because perfume is not only a thing of beauty but a worthy object to think through. Reminiscences, because perfume, ultimately, can only live when it melds with our own stories. I am of course grateful beyond words to Bertrand Duchaufour for allowing me into his world: his gift is all the more precious to me that I will be able to share it with you. I am also infinitely grateful to L’Artisan Parfumeur for asking Bertrand to develop Séville à l’aube and for giving it a place in a collection that can boast some of the most original, poetic fragrances on the market. Now, just to set your nostrils aquiver: Séville à l’aube is an orange blossom oriental with zesty, green and balsamic effects, with notes of petitgrain, petitgrain citronnier, orange blossom absolute, beeswax absolute, incense resinoid, Luisieri lavender absolute and Siam benzoin resinoid. A word to my fellow bloggers and journalists: though a few samples have been commissioned by HarperCollins for the UK press, L’Artisan Parfumeur will have its own press samples ready later in spring. Séville à l’aube will be coming out in late July, between the launches of the English and French editions of The Perfume Lover. By that time, I hope you’ll have read the book and will be eager to discover it. I swear it’ll be worth the wait. Beautiful story and so creative idea! I am really proud of you, Denyse! Pre-ordered your book already and can not wait to try Seville a l'aube! Maybe some special limited edition gift pack could be an idea at some point- Perfume Lover book plus miniature of L'Artisan- same move as in Guerlain's case. Congratulations! I am looking forward to reading your book when on the plane to Paris from Sydeny. And especially visit L'Artisan because Seville a l'aube beckons! Iodine, thank you. I'll have a bit with me in Milan, so you'll be able to smell it, though it won't be available until July. Emma, it's a pretty big book though I'm not sure it'll last the whole flight! I hope you'll enjoy it. And Mr. Duchafour made it - now I really can't wait to try it. It makes me happy that your experience was so interesting a perfume came out of it and then a book blossomed from it. Ines, yes, it's certainly been the most fascinating experience in my life as a perfume lover. The memories, the orange blossoms, the holy and profane... A memory shared among friends is a wonderful "brief" for a new perfume. I am curious about your book and about the scent. For the moment, I'm liking sweet Redemption, By Kilian's orange blossom, very much! Zazie, yes, it was a brief that didn't start as a brief, and a perfume that sprang from the perfumer's inspiration quite naturally... I think the result reflects that. And I like Sweet Redemption very much, by the way! Ok next month for the book, that's not so bad. But July for Seville a l'Aube? That is testing my patience though I am certain the wait will be rewarded by the most beautiful orange blossom scent yet made. Nicola, I wouldn't have made the announcement for the fragrance so early on, but as HarperCollins sent out advance copies with samples to journos and bloggers in the UK, I figured the news would be breaking pretty soon, and I really wanted to be the one to break it. The timing for the launch is not my decision I'm afraid! You, Duchaufour and L'Artisan - SWOON! With that, I finally succumbed to the UK preorder, even though the postage is nearly as much as the book. The UK covers are always better, so I'll be glad I did. They should really be paying you as publicist, too, Denyse! Nozknoz, thanks for succumbing! My agent is still working on an American book deal... crossing fingers! My "payment" is the privilege of having had L'Artisan Parfumeur on board with this project. There really couldn't have been a house more perfectly suited to the story: it was made for them! Karin, thank you. I hope you'll enjoy both. Congratulations, Denyse! I can't wait to read the book, and to experience Séville à l'aube. Or to remember it as a future memory. Jarvis, thank you! Séville à l'aube has moved quite a bit since you smelled one of the mods in London last year, I hope you'll love it in its new guise. Very much looking forward to both the book and the perfume. I do love how perfumes can distill and preserve essential experiences. On a less than ideal day, or really any day, it's wonderful to have an elixir in a bottle that can recreate a perfect memory. Although it's easy to run aground on the dangerous shoals of art and philosophy, your descriptions put me in mind of John Dewey's theory of aesthetics in Art and Experience. "Time and memory are true artists; they remold reality nearer to the heart's desire." Kathryn, thank you for the John Dewey reference: it echoes my experience with Séville à l'aube. In a way, it doesn't carry me back to the memory that inspired it: it has become what it asked to become, a reinvention of the story. Of course that's what I was thinking of when I wrote in yesterday's post that perfume is also a future memory. That's what I realized as Séville à l'aube was evolving: "This will be my memory not of the past, but of what I'm living now." You know, I don't think I realized that you were quite so famous, D. This is big time! Congratulations! I've signed up at Amazon U.S. to be notified when the book is available here, and I cannot wait to smell Seville a l'aube - it sounds wonderful! What a coup for both you and L'Artisan! Congratulations on this lovely collaboration. BTW, I know the book will be available on Kindle, so there's always that option. Alyssa, as I said about: right place, right time, everyone on the same page... and lots of work! But, yes, I'm hugely proud. D, an explanation based on lots of passion and lots of work make more sense to me. I don't believe in lucky coincidences. Congrats! I am having a drink right now, and I am toasting to you as well. Victoria, oh yes, passion and work went into this project... I don't believe in coincidences either, but lots of things happened at the same time, and lots of people were receptive at the *right* time to get this double project off the ground. I've had my wine earlier, but a virtual toast back to you! I will hit "Buy With One Click" the moment it is for sale on Kindle! I love your writing so a whole book will be a treat! Donna, I haven't toppled over yet into electronic books but I'm happy they exist! Congratulations!! I am so thrilled for you!! Something born of all of the creativity, talent and passion of L'Artisan, Duchafour, and you has to be amazing. I can't wait! A chill ran through me when I read your post. All of it is exciting--the book, the story, and the perfume. I'll have a hard time waiting until I can experience them at the same time. Annemarie, that is an incredibly relevant question and indeed, I do write about it in the book. I'd say the story I told Bertrand was probably already a rewrite of the actual event, as memories always are, especially when they become narrations. So it would be with the perfume: it took on its own life, dictated its own terms. Angela, I had my own chill last evening as I saw a pile of my books for the first time at the American Library in Paris, courtesy of Shakespeare and Company, for an event where I was a panelist, and "tested" the perfume on some of the people who attended... It was a wonderful feeling. Congratulations! A dream come true, can life get any better after this? maybe a second book + scent? Maureen, that's so sweet of you! I can't vouch you'll like the scent but it's had hugely good reactions so far! I can't blame any perfumer for latching onto to the magic in that sizzling scenario - phew! That a perfume has been created because of it is thrilling enough for me so I simply can't fully imagine how it felt for you. Anna, well *he* says it was the scents in the story that made sense... Of course it was incredibly thrilling to take part in the creative process, so that Séville à l'aube is both the gorgeous end result and the entire journey that led to it. Dain, thank you. Words and stories are as much a part of perfume-making as the materials, at least for some perfumers... It seems my story had all the scents that were needed, and oddly enough, they've all ended up in the formula! This is brilliant news. My nostrils are begging for the perfume and my eyes can't wait to read your Opus. I send you joy and passion and mystery: all of the things you give the world with your creations. Kiss! OMFG. What a wonderful bricolage of your memories, sensibiity, writing skills, and inspiration for a perfumer. Seville is uniquely religious and profane, everyone should experience it. The dawn after a Feria night with too much fino is beautiful and surreal. Orange blossom! And a hint of lavender too! I truly cannot wait. A sample draw? Cait, lots of love back. Remember you were the first to open Legerdenez to my fragrance writing. Sunsetsong, I see you're another lover of Seville... I remember the dawns of the Semana Santa and Feria. Some were cold as hell, and "ay los piés"! But the night leading up to Séville à l'aube was mild enough. 2012 is your year Denyse! Really look forward to both book (preordered) and scent. I am sure both will be a huge hit. Naturally readers will want to try the perfume as soon as they finish the book, shame about the lagged release; L'Artisan must be aware they may lose some business, so there must be good reasons for the delay. Silvia, I know, it's a shame the perfume and book couldn't be launched at the same time but as you say, there must be good reasons for that. I had no part in the decision-making process, but since I'm an optimist, I'm seeing this as an extra opportunity to promote the book! Denyse I wonder if this is what you were 'trialling' one evening during your December 2010 perfume course in London. I distantly remember a beautiful rich floral which will doubtless have changed significantly since them. I really look forward to smelling it and or course to reading the book before then. A gift pack is a lovely idea. Let's hope the decision makers agree. Catherine, indeed, you smelled an early version on me back in December 2010 and yes, it *has* changed quite a bit since then! you were such a fun speaker at the passion panel at the american library! i love your phrase "liquid poem" for perfume! Andrea, thank you! It was a lot of fun to be there, and exciting both because it was my first event for the book and because people seemed so receptive. I love spreading the passion! The only thing that i'm sure is that if they followed your exquisite taste it'll be one of the best fragrances from L'Artisan. 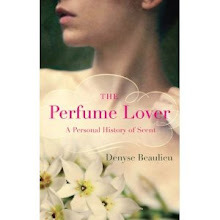 I'm happy for you Denyse, i hope that the book and the fragrance become a success! Will the book be available in English? Hope so! Irina, that's so sweet of you to say... It's a fairy tale for me too! I'm so happy for you. That is really dream come true. And a very nice one ;-). Civava, and I hope you'll see it's also a very beautifully fragrant one! Denyse, thanks for allowing me to read the book and smell the scent: I will certainly review both. I've just started reading the book (you write in the most intriguing way, and you already know it ;-), but the scent... well, the scent is marvelous, I'm wearing it now and will post my review in the next days, I'm eager to share it with others. Orange blossom is quite a tricky note, and though I'm fond of it "nature", I've tried hard to find an orange blossom scent able to capture its soffuse radiance without falling into heaviness or indolic facets. You and Bertrand treated it with rare balance. After the flowery, honeyed start, I'd expected the deeper, animalic notes to pop up, instead I got a delicately green and incense-y contrast I found extremely fascinating. I'm enjoying it very much! Marika, ciao! Glad the parcel made it safely to you, and even more that you love the scent. I can't quite claim responsibility for the balance in the notes, that's all Bertrand. But it does reflect what he, L'Artisan Parfumeur and I wanted from the scent. As it's only coming out in July there's no gigantic hurry for the fragrance review: it was provided to journalists and bloggers so that they could get the full experience. But I'll be looking forward to your impressions. Feeling blessed to have recived a copy of your book, and must say its completly captivating! I have never had rawmaterials explained in such a way before..didnt know it was possible! Thank you! Markus, what can I say? Thank you! Discussing raw materials with perfumers opens up such interesting perspectives, because they've delved into them so deeply. It's a world I would love to explore more. Obviously, the hugest possible congratulations to you. Such a richly deserved tribute to your work. I got an invite to a signing and launch in Covent Garden this morning which, sadly, I cannot attend. But the blurb contained this rather pointed phrase; "the writer will share her words, the perfumer, his talent." Ouch! Congrats again. I can't wait to smell this, and I'm sure that the online community will turn out in your support. Martinus, aw, c'mon, I think you're reading something into it that wasn't intended. What were they going to write? "Her words, his scents"? "Share their talents" would have been unclear. Anyway, it's the perfume they're selling, and the perfumer is their star, not me! Sorry you can't attend: I'm hoping for a big turn-out obviously, which I believe will be the case. And thank you for your words of support!